Used as a foundation for savoury recipes, good stocks can transform a recipe from ordinary to gourmet. Stocks are often used in dishes such as soups, sauces, gravies, stews, casseroles, risottos, tagines, biryanis or even steamboats. However, many commercial stocks are salty, expensive and often contain onion and/or garlic, making them unhealthy and high in FODMAPs. They can also have cuisine based limitations, making them unsuitable for the delicious Asian dishes you love. Here are two very simple, but mouthwatering stock recipes. They also reduce well to make concentrates, meaning they can be frozen in ice-cube trays and pulled out next time you want to make a delectable dish that is bursting with natural umami! Stocks require several hours of cooking time, making them perfect to prepare and freeze on the weekend, then pull out to use on busy work days. Place bones in a large stock pot and cover with cold tap water (around 10 cms). Bring to the boil and reduce the heat to a low simmer (do not cover). Simmer chicken stock for ~3 hours and beef stock for ~8 hours. 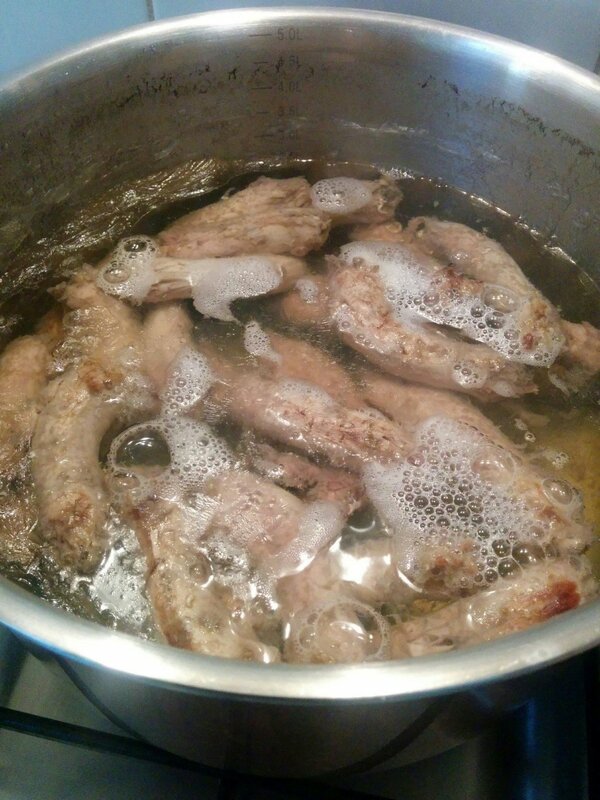 Importantly, top the pot up with boiling water during cooking to ensure the bones are covered. Strain stock though a colander. Strain again through a fine sieve back into the washed pot (the stock is ready for use at this stage). To concentrate the stock further, return to a simmer and reduce on a low heat to 1/3 its initial volume. To remove the fat, cool the unreduced stock, refrigerate overnight and then simply lift off the congealed fat layer. Alternatively, the surface fat can be carefully removed with a ladle when the stock is still hot. If reduced, these stocks can be cooled, poured into ice-cube trays and frozen. 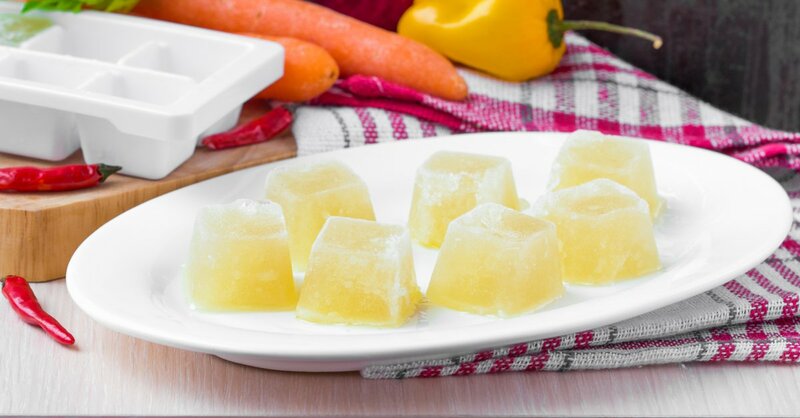 Pop the frozen cubes from the trays into a plastic container and return to the freezer. To use the reduced stock in recipes, add 2/3 their volume in water. These stocks work well in both Asian and Western recipes. 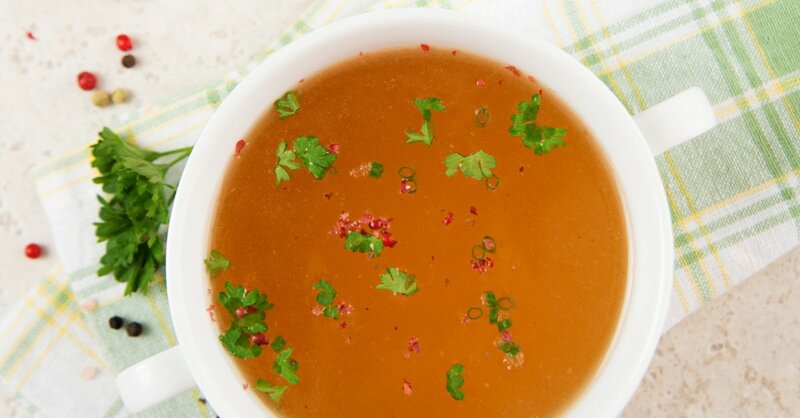 Chicken stock can also be made from the bones of a roast chicken. If you’re doing this, reduce the cooking time to 2 hours. Stocks can also be made in a pressure cooker. Chicken stock will take about 30 minutes to cook, while beef will take 1 hour. Low FODMAP herbs, spices and vegetables can be added to the stockpot for additional flavour as desired.